I AM GREATLY HONORED AND VERY PLEASED TONIGHT TO INTRODUCE TO YOU ONE OF THE FINEST MEN I KNOW. ALAN GREENBERG, WHO IS COMMONLY AND RIGHTLY KNOWN AS “ACE”-HAS BEEN DESCRIBED IN THE NEW YORK TIMES AS A “TITAN OF WALL STREET.” IT ALSO SAID HE IS GRUFF, IDIOSYNCRATIC, AND CONSUMED WITH A PASSION FOR MAKING BOOK, WHICH HE DOES EVERY DAY WHEN THE MARKET CLOSES. AS A MATTER OF FACT, AS A NATIONAL BRIDGE CHAMPION AND A MEMBER OF A FOURSOME THAT HAS BEATEN TEAMS FROM THE U.S. CONGRESS AND THE BRITISH HOUSE OF COMMONS-ALTHOUGH THEY HAD THE GOOD GRACE TO BOW TO THE HOUSE OF LORDS-ACE PROBABLY MAKES BOOK AS OFTEN AS ANYONE IN THE COUNTRY. ACE ALSO TENDS TO MAKE HIS BID, WHATEVER IT IS HE BIDS FOR. BORN IN WICHITA AND RAISED IN OKLAHOMA CITY, HE MADE AN UNLIKELY BID FOR A PLACE ON WALL STREET. AND HE GOT IT-AT $32.50 A WEEK. THAT WAS IN 1949. TWENTY-NINE YEARS LATER, IN 1978, HE BECAME CHIEF EXECUTIVE OFFICER OF THAT SAME COMPANY-BEAR, STEARNS-ONE OF THE MOST RESPECTED OF ALL THE WALL STREET FIRMS. WITHIN 11 YEARS HE TOOK BEAR, STEARNS FROM A PRIVATE PARTNERSHIP WITH $46 MILLION IN CAPITAL TO A PUBLIC COMPANY WITH $1.4 BILLION IN CAPITAL. THAT’S QUITE A TRICK IN ANYONE’S BOOK. BUT AS A LEGENDARY TRADER ON WALL STREET, ACE KNOWS THE TRICKS OF THE TRADE. AND AS AN AVID AMATEUR MAGICIAN, HE KNOWS HUNDREDS OF OTHER TRICKS, ALTHOUGH HE DENIES IT. IF YOU ASK HIM, HE SAYS “I DON’T DO TRICKS. I DO MIRACLES?’ MAYBE HE DOES, IF WE THINK OF A MIRACLE AS SIMPLY BEATING THE ODDS. ACE HAS ALWAYS BEATEN THE ODDS. WHEN HE WAS 31, THE DOCTORS TOLD HIM THAT HE HAD ONLY A 25 PERCENT CHANCE OF BEATING THE CANCER THAT THREATENED HIS LIFE. BUT THEY DIDN’T KNOW ACE. IT’S A MEASURE OF THE MAN THAT HIS RESPONSE WAS, “WELL, THE ODDS AREN’T TOO BAD-BUT THE STAKES ARE AWFULLY HIGH.” THEN HE TOOK THE HAND THAT HE WAS DEALT AND PLAYED IT EVER SLNCE FOR ALL IT IS WORTH. AS A MASTER BRIDGE PLAYER, ACE ALSO KNOWS HOW TO WIN TRICKS, AND HOW TO FINESSE TRICKS, AND EVEN THAT SOMETIMES IT’S NECESSARY TO PLAY THE DUMMY. BUT ABOVE ALL, HE UNDERSTANDS THE TRICK OF HOW TO LIVE. AS A GREAT WARRIOR OF WALL STREET, HE GIVES NO QUARTER, INVESTING IN HIS WORK THE INTENSITY THAT HE BRINGS TO EVERYTHING HE DOES. AND HE IS A MASTER OF ETHICAL CONDUCT, BECAUSE HE PLAYS BY THE SIMPLE RULES OF HONESTY AND HONOR. HE IS ALSO MASTER OF HIS AVOCATIONS-BRIDGE, MAGIC, ARCHERY, POOL, DOG TRAINING, EVEN THE YO-YO-BECAUSE WHATEVER HE ENGAGES IN HE DOFS WITH A FIERCE COMPETITIVENESS THAT IS PART OF HIS NATURE. TO ACE GREENBERG, LIFE IS FULL OF ADVENTURE. IT MUST BE, FOR HOW MANY LITTLE BOYS BORN IN WICHITA GROW UP TO BE KNIGHTED BY THE QUEEN OF DENMARK? TO PLAY BRIDGE WITH THE BEST? TO RUN ONE OF THE GREAT FIRMS IN THE FINANCIAL CAPITAL OF THE WORLD? TO BE HONORED BY NUMEROUS NATIONAL ORGANIZATIONS? THERE IS A WONDERFUL STORY THAT WOULD CHARACTERIZE ACE GREENBERG THE BOY AND ILLUMINATE THE MAN. ONCE WHEN A LITTLE BOY’S PARENTS WERE GOING OUT, THEY WANTED TO MAKE SURE HE WOULD BE GOOD FOR THE BABYSITTER. SO THEY BOUGHT HIM A JIGSAW PUZZLE OF THE WORLD THAT THEY WERE ASSURED WOULD TAKE HIM SIX OR SEVEN HOURS TO PUT TOGETHER. WHEN THEY RETURNED HOME, THE BABYSITTER TOLD THEM THAT IT HAD OCCUPIED HIM ALL OF FIVE MINUTES. WHEN HIS FATHER QUESTIONED HIM ABOUT IT, THE BOY SAID, “DADDY, A PUZZLE OF THE WORLD IS VERY COMPLICATED AND I COULD NEVER DO IT. ACE GREENBERG IS THAT RARE KIND OF PERSON YOU MEET FROM TIME TO TIME WHO, FULL OF THE RADIANCE OF LIFE, CANNOT HELP TRANSMITTING SOME OF HIS ENORMOUS ENERGY TO OTHERS. OUT OF HIS ABUNDANCE OF MORAL STRENGTH, HE BEAT A PREMATURE DEATH. WITH GRIT AND DETERMINATION, HE ROSE FROM THE POSITION OF CLERK TO C.E.O. . THROUGH DEDICATION, COMMITMENT, AND A DEEP UNDERSTANDING THAT THOSE WHO ARE BLESSED MUST GIVE BACK SOME OF WHAT THEY RECEIVE, HE HAS GAINED HONOR FOR HIS MITZVAHS TIME AND AGAIN. HE IS AN EXTRAORDINARY MAN. 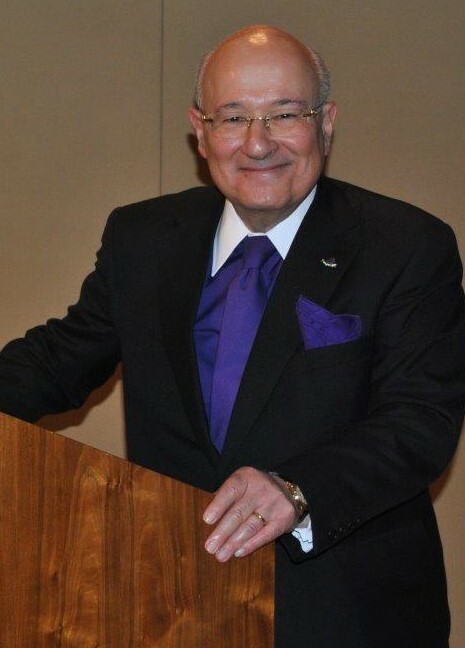 I HAVE KNOWN HIM AS A TRUSTEE OF THE SIMON WIESENTHAL CENTER, AS AN ACTIVE MEMBER OF THE NATIONAL CONFERENCE OF CHRISTIANS AND JEWS, AND AS AN INVOLVED MEMBER OF MANY OTHER WORTHY ORGANIZATIONS. AND I CAN TELL YOU IN ALL SINCERITY, THAT IF YOU NEEDED TO FIND 25 PEOPLE IN THE WHOLE WORLD WHOM YOU KNEW YOU COULD COUNT ON, ACE GREENBERG WOULD BE AT THE TOP OF THE LIST. WE ARE TRULY FORTUNATE THAT ACE AND HIS WIFE, KATHRYN OLSON, AN ATTORNEY AND THE FOUNDER OF THE NEW YORK LEGAL ASSISTANCE GROUP, COULD MANAGE TO BE WITH US TONIGHT. LADIES AND GENTLEMEN, PLEASE WELCOME A GREAT FRIEND AND A GREAT HUMAN BEING TO HAVE ON YOUR SIDE, ACE GREENBERG.